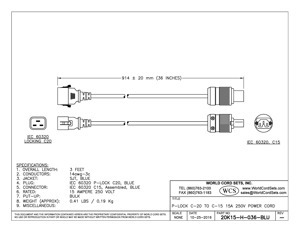 World Cord Sets, Inc is a leading distributor and manufacturer of Blue 15A P-Lock C20 C15 Power Cords's. Besides stocking North America Power Cords, International Power Cords, GFCI's, RCD's, Data Center Cables, and more, World Cord Sets is a leader in custom Power Cords, Data Cables, GFCI's and more , including IEC 60320 P-Lock C20 to C15 Power Cords . With the ability to assemble small quantity custom products, or mold custom cables for large orders, we have the cable to fit your needs. Visit our Power Cable Matrix to find the Plug/Connector configuration you are looking for.